Zucchini is a member of the gourd family and is a low calorie, high fiber, antioxidants, B vitamins and minerals like zinc and magnesium. 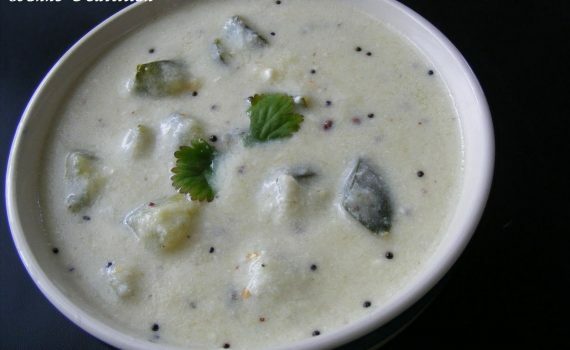 Majjige huli is a popular curry in Karnataka. It’s called “Morkulambu” in Tamil Nadu, “Majjiga Pulusu” in Andra Pradesh and “Moru Curry” in Kerala-just goes to show the similarities in cooking styles in South Indian cuisine. ‘Majjige’ is ‘buttermilk’ ,while ‘huli’ is ‘sour’ in Kannada. Usually majjige huli is made with one vegetable (like cucumber, eggplant, ashgourd, spinach,etc). I had a couple of Zucchinis in the fridge and decided to use it as the vegetable in the majjige huli. Boil the zucchini in just enough water till half done. In the meanwhile grind the coconut,green chillies, the soaked channa dal(optional), mustard and cumin seeds till you get a fine paste (add a little water when grinding). When the zucchini is half cooked add the ground masala and a cup of water and let it boil. 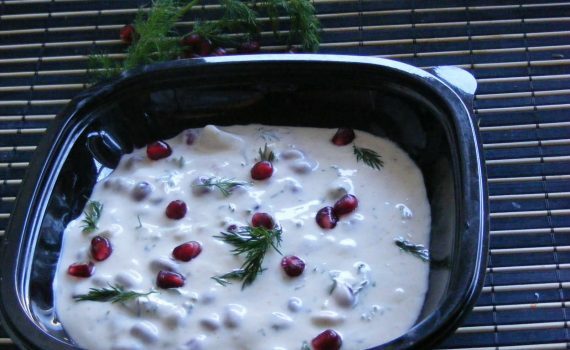 Add salt, yogurt and another cup of water and cook for a minute or two. In a separate pan, heat the oil and add the mustard,cumin and the urad dal. Wait till the mustard starts to pop, add the curry leaves , then pour the tempering over the majjige huli and mix. Serve the majjige huli hot with rice. Q: What is your favorite side dish to go with rice? Overnight oats is the new way to make oats without cooking. You simply soak the oats in your choice of liquid (water, milk, almond milk, soy milk, coconut milk) overnight in the fridge. The oats tend to absorb the liquid and soften up a little and can be eaten the next day without heating (those who don’t like eating a cold breakfast can also heat it up). Here’s a tasty smoothie that you can have for breakfast or anytime you feel like having a snack. 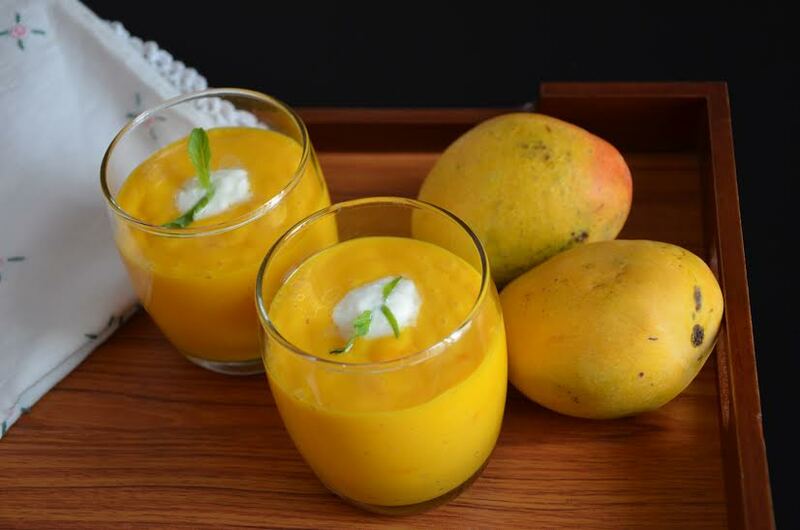 Mango- pulp of 3 nos. Soak the oats in the milk overnight in the fridge. In the morning, blend all the ingredients together in a mixer till smooth. Pour into a glass, add a dollop of curd on top. When making the smoothie for kids, you could powder the oats first and then blend along with the rest of the ingredients as they may not enjoy the texture that comes with the raw/cooked oats. You could even cook the oats, instead of soaking it overnight and add it to the blender once it has cooled. 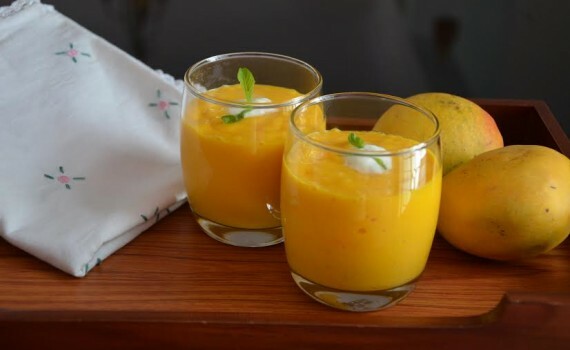 You can substitute the mango with any seasonal fruit like strawberries, peaches or bananas.